A minor mystery exists when it comes to Android tablet apps. At the press event announcing the Samsung Galaxy Tab, the first Android tablet PC, it was noted there would be revised or new apps “optimized” available for it. But what, exactly, does “optimized” mean? Discerning a difference between optimized and non-optimized apps is easy – but only after you’ve downloaded them. Non-optimized apps float in the middle of the Tab’s screen, and can’t be blown up as iPhone apps can on the iPad. Since the Tab’s Market app doesn’t segregate optimized apps, we did a search for “Galaxy Tab.” Up popped 114 results, many simply different versions of the same apps (such as multiple Museums city choices listed below). But there really isn’t any way to know if an “optimized” app simply has been imperceptibly blown up from, say, 800 x 480 pixels (the resolution of the four Samsung Galaxy S phones) to the Tab’s barely larger 1024 x 600 pixel resolution, or if more extensive tinkering has been done to exploit the slightly more expansive Tab screen real estate. Technically, all Android apps have to be “optimized” to work not only for specific Android devices (largely because screen sizes and buttons differ from phone-to-phone) but for differing Android operating system versions. Theoretically, the Market on any Android device should list only apps “optimized” for that device, one reason why you can buy Android apps only on the devices themselves, and not from a PC. 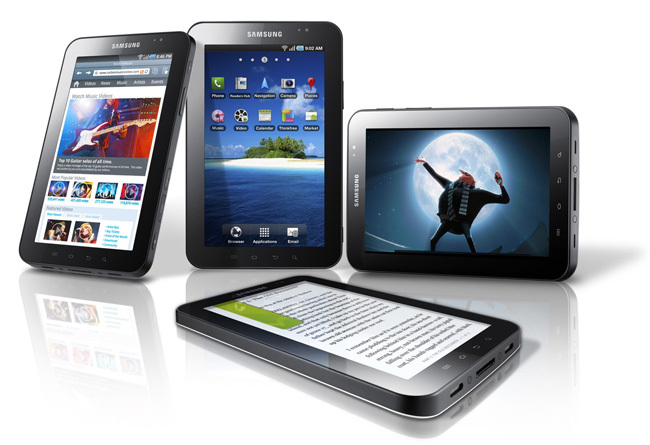 That being the case, the best way to dredge up apps that will look great on your new Android tablet remains search terms like “Galaxy Tab,” or simply checking out our guide to the best Samsung Galaxy Tab apps.